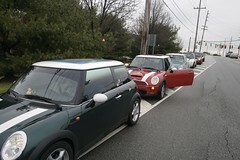 I participated in the PhillyMINI Cabin Fever Rally this past Saturday, March 24, 2007. We started just North of Otto's and took a very nice scenic route through some wonderful back roads of PA and DE. Along the way, we stopped at QVC for a tour of their studios (thanks to Dana for the free tour passes!) and at the Brandywine Nature Center. The route also included crossing two covered bridges. We capped the trip off with a lunch at Bugaboo Creek Steak House. Doug did a great job of navigating the route for us and planning the event. Wave hi to him in his British racing green Cooper with the DE state flag on the top. Link to my Flickr set. Link to Tom Ross' set and his movies.